I'd like some suggestions to correct a problem I am having with this rye I am baking. he first photo was the result in a commercial baking kitchen where I was taught the recipe. This photo is my attempt at home. I scale the recipe down from 15kg to 2.5kg, and use the same pullman loaf pan. It bakes at 490 for 45m then 400 for 45m. I keep the pan lid on for 30m in an attempt to capture some steam. I am using a 3 stage sourdough starter for the recipe. I have made several attempts and I have stalled out with this slight defect, the top of the loaf indenting about 3cm. matrix has fallen. Try to bake sooner before it proofs so high. Can also give it more of a high dome shape when panning, use a wet spatula and shape up from the edges. Rye tends to rise straight up equally so if it starts out flat, it tends to stay that way. Thanks! I did shape the top flat and did likely overproof! 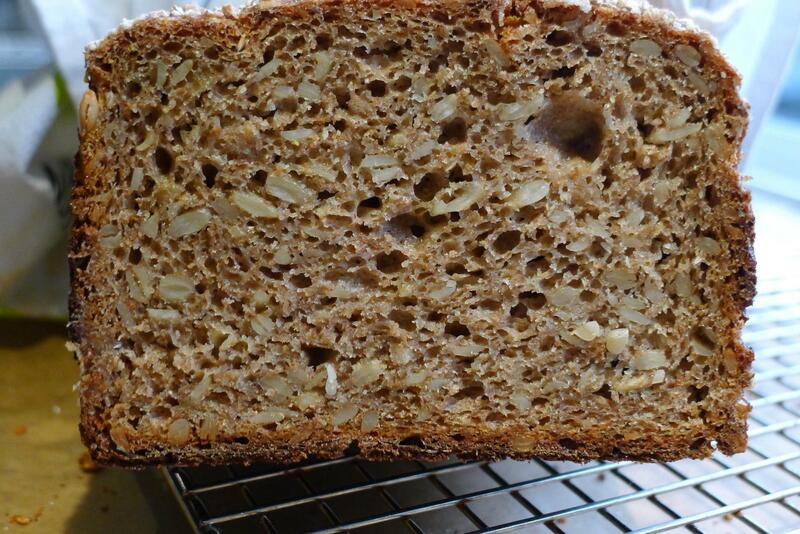 That was the most common mistake we students made during our two weeks of baking rye. surface. As the matrix breaks down, tiny bubbles will make their way up to the surface and pop. I know it as pin- holing. A smooth surface will start to show light bumps as bubbles come up. Bake before pinholing when only one or two holes can be seen. They are small so watch carefully. If there are more holes and the oven is still preheating, dock carefully (smooth over the holes) and shove the loaf onto the oven rack getting the loaf in early with the last part of preheating letting the dough rise with the heat. Start counting the bake after reaching temp desired. You may like results so much as to repeat placing the tin in the oven at 350°F (175°C) while preheating and watching the oven heat rise. Two weeks is rather short learning for rye. Must be packed with valuable info. Time to make rye bread! The pics got me. Rye is so tricky to proof. The moment it is fully proofed, it can go overproofed in minutes! I learned that I need to keep my rye loaves proofing on the counter where I can keep them in constant view rather than in my over-the-range microwave where I have to get a stepstool to see them. Also, when rye is proofing, that is NOT the time to be multitasking. Plenty of time for multitasking when it is baking (with a timer set). If you enjoy rye, take a look at THIS wonderful site authored by our very own Stan Ginsberg. Hi! The rye bread is almost never baked with steam, It should be started with highest temp for 15 min and then try to lower it to 400F for 40-50 min. May be it makes scene to skip the lid? The dent in the middle is probably caused by over proofing. And your crust is a little too dense, try to add 20-30 gm of water next time. Thank you everyone for your great comments and suggestions. I have resolved one problem and created another, lesser issue :) too thick a bottom crust. Shorter final proofing time, and higher hydration made a significant improvement. Next iteration I will proof longer and increase hydration, bake at the higher temperature for a shorter time. That loaf looks like a loaf baked in an oven with a bottom element. Try raising the oven rack 1 higher or putting the loaf pan on a cookie sheet to act as a little bit of a shield from the bottom element. That might solve the issue for you. Yes, it is a gas range. I usually place a cookie sheet on the bottom rack. Thanks for the reminder. I also want to turn the heat down sooner as an other person commented and bake a bit longer.